The media meets its match. Ever since Hillary Clinton's campaign treated it as a political weapon, Barack Obama's birth certificate has been the question that never quite goes away but always seems about to. For the last year or two, it's been almost a dead issue; even mention the phrase in public and you're laughed into the category of Flat Earthers and other loons. Then, without warning, this scrap of paper, so conspicuous by its absence, was yanked back into national prominence. First, the newly elected Democratic governor of Hawaii unexpectedly announced his determination to lay the rumors to rest, ostentatiously failed to cough up any new evidence, and crawled back into the gubernatorial mansion pursued by jeers and catcalls from both sides. "I want him to show his birth certificate. I want him to show his birth certificate," Trump shouted to the show's five co-hosts. "There's something on that birth certificate that he doesn't like." Trump, who was on the show to discuss his own potential presidential run in 2012, said he felt Obama was probably born in the U.S. But the follicle-challenged "Apprentice" host argued the president has been reluctant to definitively prove his detractors wrong. "I really believe there's a birth certificate," Trump said. "Why doesn't he show his birth certificate? And you know what? I wish he would. I think it's a terrible pale that's hanging over him." Which is precisely the point: Without exception, every mainstream media organization insists on determinedly missing the point. As Scragged has previously reported, there is an Obama birth certificate widely available on the Internet and there's no reason to believe it's a forgery. Even if 100% genuine, 100% legal, and a 100% accurate reflection of Hawaii's records as its governor claims, however, that particular document simply does not prove what the media would have us believe it proves. Pierce through the derisive tone of the FactCheck writers who personally examined the document, and you'll realize that they, too, are missing the point. Yes, it's a genuine "Certification of Birth" with all the official signs and stamps from the State of Hawaii. It would be legally sufficient to get a drivers license, a U.S. passport, or to claim Social Security benefits. All it is, however, is a modern computer printout. It's only a few years old. What "birthers" want to see are the original records filed at the time - and those are precisely what nobody has ever seen who's willing to talk about precisely what's on them. A hospital certificate of birth, on a hospital form, recording the names of the child and the parents and signed by the attending physician and hospital witness. This is what Mr. Trump first released; legally, it doesn't meet the requirements to get a passport because the noncitizen child of foreign diplomats might have one, but it does prove exactly where and when you were born, to whom and by whom. A photostat of his Certificate of Birth Registration for New York City. This is the key document that "birthers" want Mr. Obama to make public and which he has steadfastly refused to discuss. Mr. Trump's document is a copy of the original which is on file in New York City's archives. The original document was completed in 1946 and signed by officials provably on duty at the time. What's more, it says everything you could possibly want to know about the baby's heritage, from the places of birth, full names and occupations of both parents to their residence, hospital, and number of other children. A certification of birth from the New York Department of Health which is basically the same document as the Obama "birth certificate" that's been examined and certified as genuine. This document is what you use to get a passport, but like Mr. Obama's, it's just a modern computer printout and says nothing about who delivered the baby or where. A credit card receipt included in the paperwork provided by Trump shows he ordered the copy of the birth certificate on April 27th, 1999. The birth certificate shows it was issued the next day on 4-28-99. He was, of course, born a half-century earlier than his "certification of birth" was printed, just like Mr. Obama. That's why an original hospital or birth registration certificate, which Mr. Trump has and Mr. Obama hasn't, is of such keen interest despite three solid years of media pooh-poohing. As we explained in our first foray into this relatively simple but well-camouflaged issue, there are several entirely legal and routine ways whereby a person could have an official government "certification of birth" and yet not in fact have been naturally born in the United States. For 99.9999% of us, this will never matter. It makes no difference whether you are born in the US, born overseas to American parents, born overseas and then adopted by American parents, or naturalized as an adult; you still have all the same rights and privileges of any other American citizen from whatever origin. The single, solitary, one and only case where it makes a difference is if you want to be President of the United States. The Constitution clearly states that a President must be "natural born"; no other office bears as heavy a burden. But then, not too many job descriptions include Leader of the Free World and Most Powerful Man on Earth; isn't it only logical to be picky about who qualifies? As we've said before, and as Mr. Trump pointed out, we'll never really know. Being the most powerful person on the planet, Mr. Obama could have whatever documents he pleased forged by experts at the CIA or elsewhere. Mr. Trump thinks Mr. Obama really was born in Hawaii and thus is (technically) qualified to be President. Truth be told, we do too; it's a shame we can't be sure. Maybe his original Certificate of Birth Registration says he's a Muslim though, like Mr. Trump thinks it does? Maybe Barack Obama Sr., on whom Barack Obama Jr's personal narrative is based, isn't really his father? We'll never know - and when we're talking about the President of the United States, we ought to know. Our disappointment that our media refuse to look into it knows no bounds. The recent discovery that Mr. Obama's Social Security number was issued in Connecticut is meaningless. No law requires parents to obtain a Social Security number for newborns; you have to have one to hold a job which few babies do. Today, almost all parents get an SSN immediately after birth so they can deduct the baby on their income taxes, but this wasn't required until 1986, and even then only for children older than 5, expanded to all children some years after that. Given that Mr. Obama reportedly attended college at Columbia University in New York City and wouldn't necessarily have needed to hold a job before that, it's quite plausible that he got his Social Security number, yes, in Connecticut. Your humble correspondent can testify on this point: my own spouse has a birthplace and an SSN from opposite ends of the country because they were separated by many years, and I accompanied my teenage sibling to the Social Security office when a number was needed to apply for college loans - all in strictest accordance with the laws at the time. The bottom line? Regarding Mr. Obama's true origins, there is no bottom line and never will be. There is far too much murk and far too many politically-charged vested interests for the truth to demonstrably and provably come out. The question of the true origins of Barack Hussein Obama Jr. remains, however, a powerful lesson for the liberal media: Try as they might, they do not wholly control the narrative. They cannot make questions vanish simply by ridiculing them. There will always be someone who cares nothing for ridicule - if Donald Trump were afraid of being made fun of, he'd banish that ailing marsupial from the top of his head. Given that Mr. Trump is the landlord to half the opinionmakers of the New York media, they can't ignore him completely; given that middle America seems to find the guy entertaining, they don't really want to. Whether or not he is serious about running for President, The Donald has helped ensure that middle America will continue to have nagging questions about just exactly who and what our current President actually is. Nobody could pull this on John McCain. He wasn't born in the US, but given that his father was a serving American admiral and he himself is a war hero, nobody cares. His detractors tried to raise that point, but it went nowhere because whatever you may think of his politics, Sen. McCain is American through and through. Mr. Obama's natal paperwork wouldn't matter if Mr. Obama acted like an American President, but he doesn't. 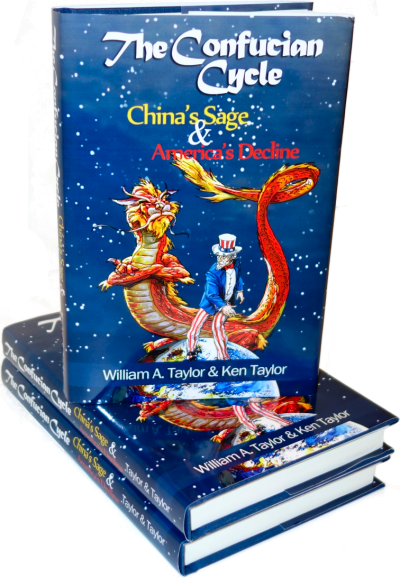 American Presidents don't bow to foreign kings, American Presidents honor the Pledge of Allegiance, American Presidents don't blame America for all the world's ills. And most certainly, American Presidents are Americans, not "citizens of the world." Mr. Obama doesn't act like an American. He can't, or won't, prove that he truly is an American either by deed or by document. There's only one way we can fix that problem, and it's at the ballot box, not the Hawaii state archives. More's the pity. 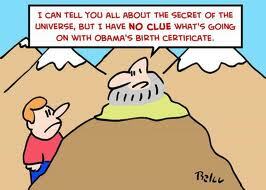 The "truth" about Obama's birth certificate. Great summary of where the whole issue stands. This has got to be the most thorough report on the matter I've read yet, and easily the clearest. "if Donald Trump were afraid of being made fun of, he'd banish that ailing marsupial from the top of his head." Mr. Trump even got the NY Times' attention! You really should read the entire article - it sums up the MSM's pouring ridicule on the issue and completely ignoring the issue of the missing hospital records. Donald Trump has written a letter complaining about me. “Her storytelling ability and word usage (coming from me, who has written many bestsellers), is not at a very high level,” he penned. But about the letter. Mainly, it’s a list of alleged evidence that Barack Obama was not born in the United States. Trump has made this the centerpiece of his faux presidential campaign, falling further and further into the land of the lunatic fringe. I find this a disturbing spectacle — a little like seeing a guy you know from the neighborhood suddenly turn up in the middle of Times Square with his face painted blue and yelling about space aliens. “Bill Ayers wrote ‘Dreams From My Father,’ I have no doubt about it,” Trump told Joe Scarborough, who reported on Politico.com. Ayers is the former ’60s radical who became a huge Republican talking point in 2008 because he had once given a house party for Obama when he was running for state senate. It’s a pretty big jump from coffee and cookies to writing an entire book, but I guess that’s what neighbors are for. Did I mention that, in his letter, Trump complained about my calling him a “birther” because the word was “very derogatory and meant in a derogatory way”? Obama, of course, graduated from Columbia University and Harvard Law School — if you can believe Columbia and Harvard Law. The Times printed Mr. Trump's letter. His closing line is a masterpiece of understatement: Open your eyes, Gail, there's at least a good chance that Barack Hussein Obama has made mincemeat out of our great and cherished Constitution! "Good chance" indeed! Dead cert if you ask me. As far as her comments on the so-called “birther” issue, I don't need Ms. Collins's advice. There is a very large segment of our society who believe that Barack Obama, indeed, was not born in the United States. His grandmother from Kenya stated, on tape, that he was born in Kenya and she was there to watch the birth. His family in Honolulu is fighting over which hospital in Hawaii he was born in-they just don't know.